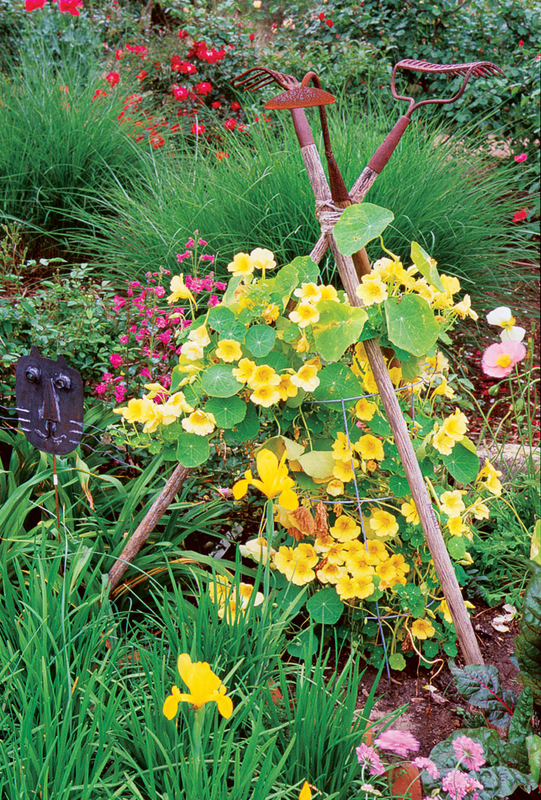 For a quick, inexpensive support for climbing plants, build a simple tipi of natural materials you may already have. Because they are easily moved, tipis lend themselves to vegetables such as runner beans, which may not occupy the same spot next year. Not only does the structure put the veggies at a convenient height for harvesting, it creates a focal point on its own. Depending on the wood species you choose for the poles a tipi may last only a year or two, or it could stay rot-free for six or seven years. Use branch cuttings from your own yard, or watch for crews of tree cutters; you may be able to ask for some branches from their chipper pile. Trees that grow near a swamp, pond or river often have good flexibility. Cedar, cypress, oak, elm and apple will likely last for at least a few years. Scrubby or fast-growing trees like sycamore, mulberry and grape vines, however, may rot in a year or two. For a longer-lasting tipi, wrap with copper or galvanized steel wire, then cover the wire with a rope made of grapevines or willow; you may need to replace the wrapping every year or so. Those old tools you have lying around in the garage may be too weathered to be of practical use, but consider forming them into a rustic tipi. 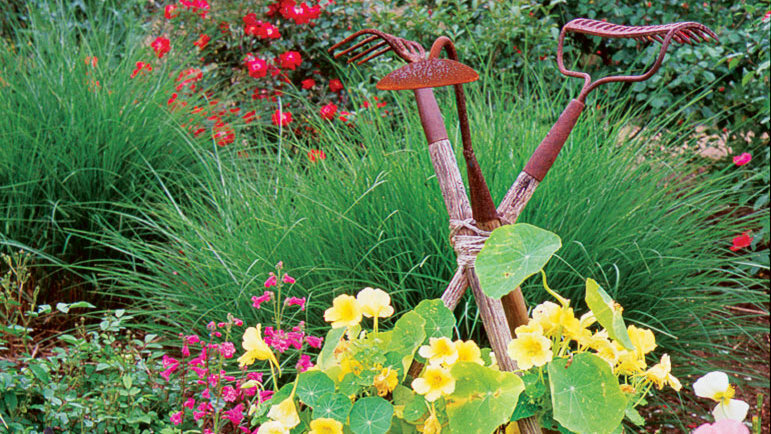 Once placed in a garden setting, all that rusty metal and weather-beaten wood becomes charming and nostalgia-inducing. The tipi at left started with a common galvanized steel tomato cage, cut to fit. This takes the bulk of the foliage, allowing the used tools to be on greater display. The garden tools are simply placed outside the tomato support and tied at the top with twine. Most old tools have handles made of hickory or other very hard wood, so they can last for a surprising number of years.